I realised I have been taking Singapore local food for granted the moment we start living overseas. Singapore hawker food is cheap and easily accessible so there’s never a worry when I was living in Singapore. Here, though Asian food are not that difficult to find, it’s incredibly expensive and not as tasty. As such, my friends (who are also living here) and I started recreating our Singapore favourites over the past one year plus and one dish that we make quite often is this Chinese Braised Mushrooms. It is the heart, the soul, and an important base for Shredded Chicken Hor Fun (Rice Noodle / 鸡丝河粉) and Bak Chor Mee (Dry Tossed Noodles with Minced Meat / 肉脞面). Shiitake mushrooms is a versatile and essential ingredient mainly in Asian cuisine, so I always stock up at least 500 grams of them whenever I go back Singapore, because it’s cheaper in Singapore and I can be more assured of the quality. I like to get the mushrooms at a wet market as they are more reasonably priced as compared to those packed in pretty-looking boxes. Some sellers can actually vacuum-pack the mushrooms so it’s easier to pack them in the luggage. My mom always store the dried mushrooms in the refrigerator (in the crisper section) so I do the same too. Shiitake mushrooms’ stalks are often discarded or saved for stocks as it’s too hard to consume. However, the stalks don’t have to be removed for this braised mushrooms dish as the hour long of braising will soften the stalks. 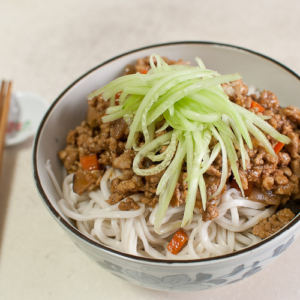 You can make them a day or two ahead and keep them in the refrigerator, just heat them up before tossing them into your noodles. I like to make a full recipe and eat it over 2 days, first day for Shredded Chicken Hor Fun and the second day for Bak Chor Mee. No step-by-step photos today because I really don’t think you will need them! I’ll leave you all with the braised mushrooms recipe today, and follow up with a recipe for Shredded Chicken Hor Fun soon, so stay tuned! 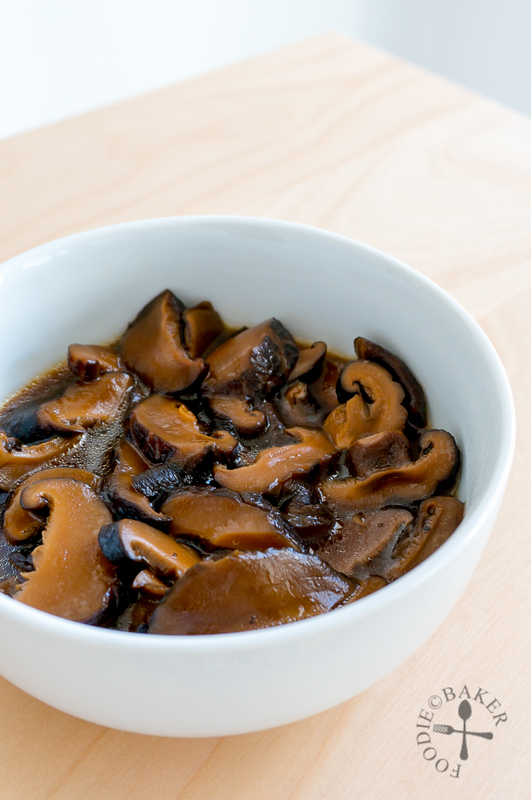 Pour water over shiitake mushrooms and place a small bowl on top of the mushrooms to submerge them in the water. Soak them overnight until softened. If rushing for time, use hot water. Don't discard the mushroom water! 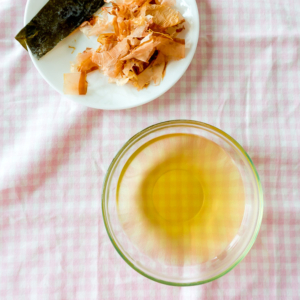 Slice the softened shiitake mushrooms into thin slices (no need to discard the stalk). 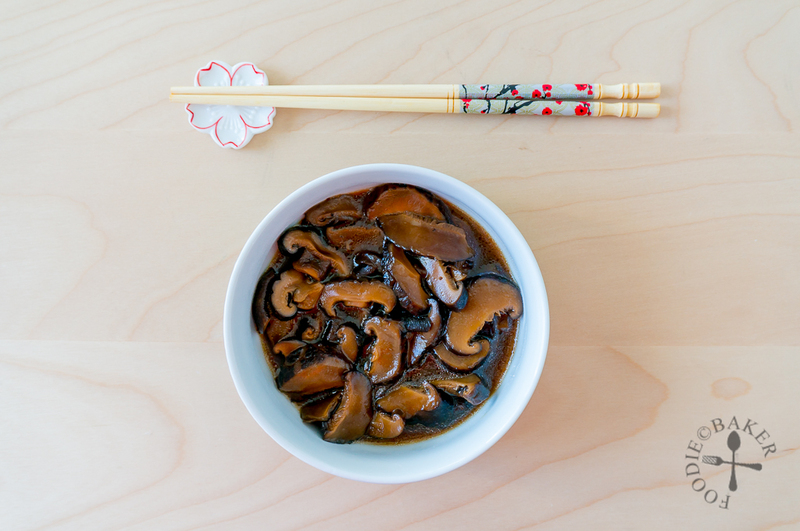 Combine the sliced shiitake mushrooms, mushroom water, oyster sauce, sesame oil, light and dark soy sauce, and 500 ml water in a small pot. Cover and bring to a boil. 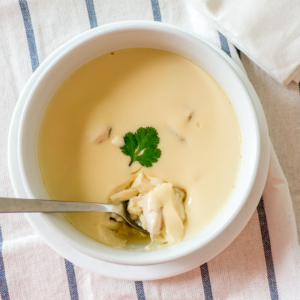 Turn the heat down and simmer for 1 hour until the mushrooms are incredibly soft and infused with all the flavours. 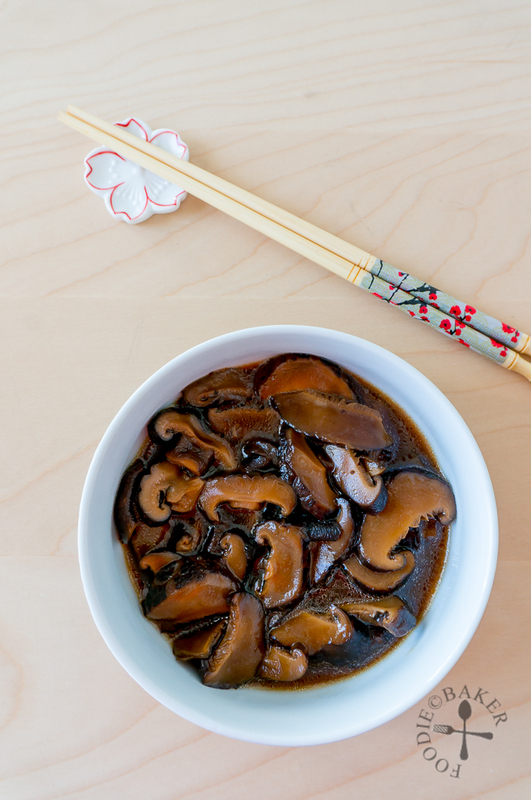 Spoon the braised mushroom onto rice or tossed into your noodles. - You can simmer the mushrooms for a longer timing, just make sure the water does not dry up. - If the water is drying up while you are simmering, top it up with water to just cover the mushrooms. Do you think I could substitute shiitake with oyster mushrooms? Hi Kala, I think it will be possible, but I don’t think you will not need to braise the oyster mushrooms for as long as the dried shiitake mushrooms. I love mushrooms, especially Shiitake, and would love to try this. I hate throwing away the stalks and it’s nice to know that they can be consumed with this preparation. Sorry, I’ve been absent for the past few weeks. I broke my wrist in an auto accident in July 🙁 It still hurts a little to use a keyboard but I’m trying. Oh dear Susan! I’m so sorry to hear about it. It must have been a terrible fright, being involved in an accident. I hope your wrist recovers soon! Please don’t force yourself and rest more! 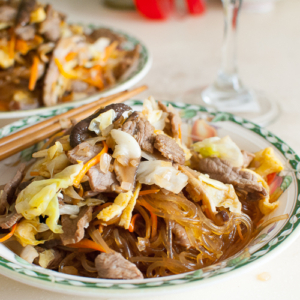 That looks like a nice dish to put on top of a freshly steamed rice, noodles or even congee! Thank you Raymond! It certainly is, my favourite is to toss it with noodles! 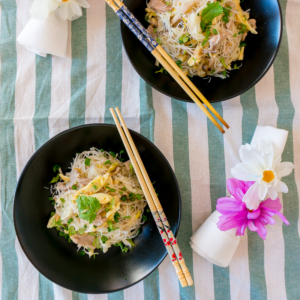 Thank you for sharing this tasty recipe with us. Enjoy your holiday in Switzerland. Thanks Karen! I just returned a few days back, wish I can be there longer! 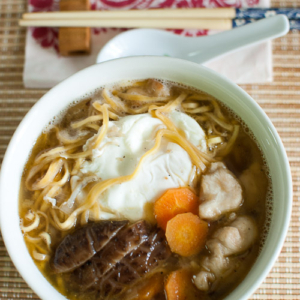 Love shiitake mushrooms and that broth is just amazing. I am still on the look out for a good Asian grocery store as we need many supplies. I miss the wet markets the most, especially in SG where you can get fresh pandan leaves. . Pinned! Thank you Bobbi. I hope you find a good Asian grocery store soon! Here it’s impossible to find pandan too, so I brought a bunch of pandan from Singapore, wash and dry it, and stuffed it in small bunches in ziploc bags in the freezer. Hope you will be able to get your hands on some soon! Looking at this makes my mouth water. So good with just plain porridge!